The phrase sticks in my mind. I surely read it in an SF novel, or more than one, and perhaps in a variation like daily moonship. Since it is an evocative phrase, at any rate to me, let us evoke something from it. The weekly moonship. Just the name tells us a good deal about Luna's place in human affairs: we go there every week, at least most weeks. It might be more; perhaps connecting flights depart from Cape Canaveral on Mondays, Baikonur on Tuesdays, and so on. But let us modestly stick to a single weekly moonship. Not only do we know that we go to the Moon weekly, we can venture a broad guess as to how many people make the trip. Our moonship surely carries more than a couple of passengers, fewer than a thousand; a broad range might be 10-200. We will say fifty: our moonship has the seating of a 1950s airliner or transcontinental train coach. Since the Luna round trip takes a week, weekly service probably means two passenger ships taking turns, with a third - perhaps an older model, less economical to fly - in reserve. For landing on the lunar surface, a shorter mission, one lander will do, with one in reserve. One or two ships suffice for other distant orbits, so altogether we have a generous half dozen passenger ships working the Moon and other locales in the outer reaches of Earth's orbital space. And we will suppose that these ships mostly fill their seats, unlike the rather similar spaceliner in 2001 that carried Heywood Floyd to the Moon in solitary VIP splendor. So about 2500 passengers travel to Luna each year, at least to lunar orbit; most continue on down to the surface. At this stage nearly all are making the round trip; if most are serving six-month rotations we have about a thousand regular residents of Luna Base and its outliers. Passengers making shorter stays nudge up the lunar population - as does anyone staying on past six months. Add a few hundred people in lunar orbit, or other distant orbits, for a total of roughly 2000 people in the outer orbital zone. Beyond that zone we might suppose that about fifty people are on or orbiting Mars, with a similar number aboard exploratory missions elsewhere - perhaps a half dozen active deep space ships that carry human crews, plus some robotic freighters that can take slower orbits. If the deep space missions use electric propulsion they depart from high orbits or at least refuel and take crew aboard there; if they use chemfuel or (properly shielded!) atomic rockets they blast straight out of low orbit for maximum Oberth effect. In that case the human presence in outer orbital space may still be confined largely to the Moon itself, and lunar orbit. But we are not mainly concerned here with deep space. Anyway, you cannot yet buy a ticket aboard the biennial Mars ship the way you can with the weekly moonship. Looking inward, towards Earth, we can expect to find more people. Geosynch is economically important but surprisingly difficult to reach - nearly twice as hard as jumping over the Moon, as Apollo 8 did. Geosynchronous orbits are awkwardly placed: High enough that it takes a big burn to get there, close enough, thus with high orbital speed, that it takes sizable burns to match orbit, then head back down. So geosynch traffic is purely utilitarian, and the human presence perhaps less than in lunar orbit. A single passenger ship can serve this route, with one in reserve. Low Earth orbit is a different matter. It is the closest place in space, the easiest and cheapest to reach, and for many purposes and most passengers that is enough. Tourists can float and gawk as well here as anywhere. Virtual tourism is also served; Xollywood can and will use low Earth orbit as stand-in for the universe. So ... taking a not too deep breath, let us say that there are 10,000 people in low Earth orbit at a given time, ten times the lunar population. For those who are staying weeks or months in space, this corresponds to a tenfold increase in traffic volume, about 25,000 people going up every year for fairly long stays. But low Earth orbit allows quicker trips than the week-long journey to the Moon. So let us say that about ten percent of the people in low orbit are visiting for short stays of less than a week, adding about 50,000 annual trips, for a total of 75,000. And let us round things out by adding 25,000 tourists who simply go up and down, never exiting the shuttle, but going back with memories. Thus, 100,000 (!) passengers to space every year, a few hundred daily. If our passenger shuttles also carry fifty people, there are five or six daily flights to orbit worldwide. Allow, 'conservatively,' a one week turnaround, and there are about forty shuttles in the service rotation. Perhaps fifty in the active fleet, allowing for maintenance cycles, some in reserve, and so on. In human terms this is some serious traveling. We can suppose that the baseline human lift cost to low orbit is perhaps $50,000 (in present day USD), but that is an average. Business travelers will pay another $20K for a reserved ticket and 'complementary' cocktail; most pay cheerfully because they aren't paying; their company picks up the tab. Tourists fly standby and bring their own libations. They also benefit from the economics of unsold seats on the bus. The seats go into orbit whether or not any passengers are floating above them. The direct cost of lifting each passenger is really only a ton or two of propellant, at Earth industrial price, plus an airline meal. Which means that some seats will be sold pretty cheap, and even us peasants can pass on that new car, and instead spend a day looking the universe in the eye. The payload we care most about is us, but we must say a little about cargo traffic as well, especially since much of it also involves us intimately: food and shelter. At this level of development, growing food in space is still in trial stage; daily sustenance comes up from Earth. My baseline 'cheap' orbit lift cost is $100,000/ton, $45 per old fashioned pound. That is roughly ten times the grocery store price of everyday goods, but not much more than the price of luxury items. People in space will eat well, because the lobster doesn't cost much more than the rice you serve it with. In general, everyday economics has the boom-town combination of sky high all-around prices with peculiar twists. You also need a place to stay. The most massive and crucial structural works in space are not ships but dormitory habitat modules: where you live, if you are living in space or on the Moon. My baseline guesstimate for these is about 20 cubic meters and 10 tons per person. If you stripped all the laboratory equipment and such out of the International Space Station, beefed up life support, and fitted its pressure modules out like a Pullman train, it would have roomettes for some 45 people, which sounds about right. Booking a hab roomette as a hotel room might come to about $10,000 per night minimum - more inflated than the price of food, because the thing is so heavy. There may be bad hotels in space, but at this level of development there are not yet any cheap ones. For 10,000 people in low orbit, thus about 100,000 tons of habitat, plus we might suppose another 100,000 tons of other facilities such as those Xollywood sound(less) stages. Annual orbit lift needed to support, maintain, upgrade, and expand it all might come to 30 percent of the total, 60,000 tons. Suppose we have two main classes of cargo lifters. Most carry up about 25 tons, and are cargo counterparts of the passenger shuttles. About a fifth are heavy lifters, 100 tons to orbit, carrying about half the total load. Average payload is 40 tons, so 1500 flights per year, about five daily including one heavy lifter. The fleet of cargo shuttles comes to about forty vehicles, so altogether our orbital shuttle fleet approaches a hundred (two-stage) vehicles. The thousand people on the Moon, and the other thousand or so elsewhere in orbital space, also need room and board - coming to some 40,000 tons of imported structures, and about 12,000 tons per year in up-bound cargo traffic from Earth, half of it going to the Moon. To carry this cargo up we will need a few more shuttles, and to take it on outward we need a small fleet of cargo ships. Let each carry 60 tons of cargo - comparable, for these longer trips, to the 50 seats aboard the passenger ships - and we have a couple of cargo moonships per week as well as the passenger ship. Altogether the cargo fleet working beyond low Earth orbit will number about a dozen ships - add the passenger fleet for a total of around 20. So we come full circle to the weekly (passenger) moonship. A ticket will not come cheap, because lunar propellant is probably not yet competitive for use on low Earth orbit. Propellant sent up from Earth to an orbital depot is a relatively simple bulk payload suited to maximum streamlining of operations, and the price might get pushed down to $50,000 per ton. A ton of lunar propellant delivered to low Earth orbit needs at least another ton or so to get it there, even with solar electric kites for the second leg of the trip, so the price point to match for lunar production is around $25,000 per ton at the source. Moreover, rocket propellant uses a larger proportion of hydrogen than ice contains, thus perhaps two tons of ice per ton of propellant extracted. Altogether, to make lunar propellant competitive in low Earth orbit you may need to bring production cost down to $250 per ton of lunar regolith that must be crunched to obtain the ice - a pretty demanding order for mining on the Moon. Lunar propellant is much more competitive in lunar space, versus propellant lifted all that way from Earth, but low Earth orbit will favor Earth-sourced propellant for a long time, even permanently if launch costs come down enough. Our weekly moonship needs about four tons of propellant per passenger, costing $200,000 on orbit (and not counting, for Earth passengers, their ticket to orbit). All in all, upwards of a quarter million on average to fly to the Moon. Robert Heinlein, writing in 1949, pegged the full Earth-to-Moon lift at $30 per pound - equivalent, at current prices, to $299.75 (almost exactly 10x inflation), or $660,649 per ton. So we are beating Heinlein's price hands down. That said, even filling that last empty seat will set you back a minimum of $30,000 in propellant to lift you and your baggage. But hey, a best-case total of maybe $50K or so to fly to the Moon? Not shabby. Stepping back, the vision I have sketched here looks very much on the same scale as what Kubrick and Clarke gave us in 2001: A Space Odyssey. One estimate for the mass of Space Station V in the film comes to 68,000 tons, about a third of my estimate for total low-orbit presence. The operating technology I've presumed - chemfuel rockets for all routine operations - is speculation-free, aside from the bit of magitech faerie dust needed to make space operations routine. We probably could have done it by 2001, had space development continued at the white hot pace of 1968. The whole shebang - shuttles, orbital stations and habs, moonships and Luna base, all of it - has a combined mass somewhat less than 300,000 tons. By my million-dollars-per-ton guesstimate, which applies to commercial airliners - and expendable rocket stages - today, it would cost us not quite a third of a trillion dollars to build it all, and $100 billion or so to operate it each year. In an earlier development stage, when spacecraft are still largely handbuilt prototypes, the same money will only buy about a tenth as much - still a respectable start: a thousand people in space, a hundred on the Moon, the cost falling and development expanding as experience is gained and economies of scale kick in. I had intended to write about Ships for the Orbital Patrol. But the whole subject of 'local' space keeps expanding, and what can I do but expand along with it? The first image, from an online model store, is a 3D rendering of the Von Braun moonship proposal of the 1950s. It carried about fifty people, but obviously did not aerobrake on the return trip. The second image, from Space Collective, shows the lunar liner from 2001. Space is vast. But most of it is empty, and we pass through only to get somewhere. The people who live and work in space will mainly do so somewhere, in some region of local space, most often a planet's orbital space, including the moon systems of giant planets. So to celebrate my return to regular blogging (touch wood! ), some old fashioned goodness: ships and travel in orbital space, mainly Earth's: exactly what it says on the tin. But first of all I want to thank all of you who have visited Rocketpunk Manifesto during my prolonged absence. Especially I thank the commenters here for keeping the conversation going, and in exemplary fashion. You are why I am back here to talk more about space. Orbital and local space get lip service, with most of our attention drawn to the grandeur of interplanetary or interstellar travel. But orbital space, and the ships that ply it, deserve more attention. Every journey from world to world passes through orbital space; indeed begins and ends there, unless your starships land directly on planets. A routinely spacefaring future will surely have many stations and other habitats in orbital space, or on the Moon or a counterpart. And every world's orbital space is unique, shaped by its particular circumstances. Mars has two tiny moons, close in; Earth has a single enormous one at the far fringes of its orbital space. Local space may also emerge in regions far from any large body, perhaps because of interesting concentrations of small objects, e.g. asteroids, or simply because habitats have congregated there. Wherever people gather in space, with regular traffic among them, there is a region of local space. This traffic has a tempo and flavor quite different from deep space travel. Travel times are short: four hours to geosynch, the popular geosynchronous 24-hour orbit; three or four days to the Moon. 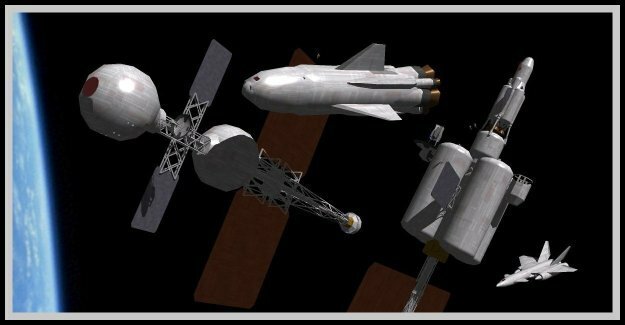 Spacecraft in orbital service will range from moonships down to what I call taxis, minimal space capsules used to move between larger spacecraft that have made rendezvous but are not docked together. Most local craft will be fairly small, because they can be. Passengers can be accommodated coach fashion, in airline type seats (or just above them, loosely strapped in). Crews may have a little more room to float around, but probably do not live aboard their craft between missions. Maximum design endurance is perhaps two weeks, the current standard. The distinction between ships and stations, which can be a bit blurred in deep space, is sharp in local space: stations and habs you live in versus craft you travel in. Passenger ships surely have viewports, because the views are spectacular. Orbital space itself is vast, a thousand times a thousand miles across, but it does not quite share the chill loneliness of deep space, weeks and many millions of kilometers from anywhere. In all, there is something comfortably human about travel in local space, especially a world's orbital space. And this travel will most likely be aboard plain old chemical-fuel rocket ships, surely into the midfuture, and even in what the commenter community here has dubbed the PFF, the plausible far future. My text for this sermon is the set of delta v maps, especially the first of them, at the still ever-growing Atomic Rockets site. These maps show the combined speed changes, delta v in the biz, that you need to carry out common missions in Earth and Mars orbital space, such as going from low Earth orbit to lunar orbit and back. Propellant thirstiness does impose odd logistics and economics, because every ton of payload needs three or four tons of propellant to dispatch it on each leg of major trips. Inter-orbit tankers and other bulk cargo can ride slow solar-electric kites, taking a couple of weeks to spiral up and down to geosynch, a month or more to the Moon and back. But these are not for human travel; besides being slow, they spend days at a time in the Van Allen belts. Nuclear thermal rockets, NTRs - the original atomic rockets - are one alternative, but a limited one. For local operations their engines must have all-around shielding, because an unshielded nuclear reactor poses a low-level but significant long term radiation hazard out to an amazing distance in space - about 100,000 km radius for a gigawatt reactor. This would not make for good neighbors in local space. Heavy shielding limits nuclear propulsion to larger spacecraft, probably in the thousand-ton class, and with relatively sluggish performance: landing even on the Moon is problematic. Big ships do get the most saving from halved propellant consumption, but nuclear propulsion is not a panacea for travel in local space. Torch-level drives would be worse; torchships must normally stay out at the fringes of a world's orbital space, met by rockets to ferry passengers up and down. Other possible options - laser propulsion or other beamed power, mass drivers, and so on - have their own constraints. And even outright magitech drives will be hard put to match the flexible power of rockets for people in a hurry. Not to mention that if you want opera, big rockets are positively Wagnerian. Aboard a ship that might even be streamlined, with wings or fins, built for aerobraking as well as landing on airless worlds. Ordinary transport types would not combine these features, but emergency response craft, built for versatility rather than economy, might well do so. We will look more closely at such ships in our next exciting episode. But the most astonishing thing about travel in local space is that it not only is operatic and rocketpunk, it is also real. Forty-six years ago next month we carried out the combined lunar orbit and lunar landing missions, returning safely to Earth. 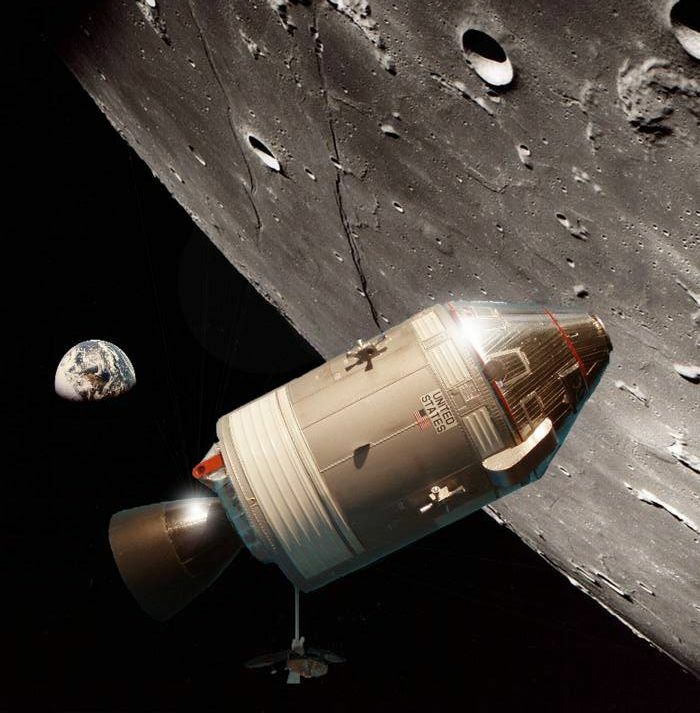 So the only real matter for speculation is not whether we can cross orbital space to the Moon, or even (details aside) how, but only when we will decide to go back again. The image comes from a blog post reflecting on Apollo 8, which as the author says deserves to be more remembered. I remember looking up at the half moon at twilight on a clear Christmas Eve, in awe that there were people up there.